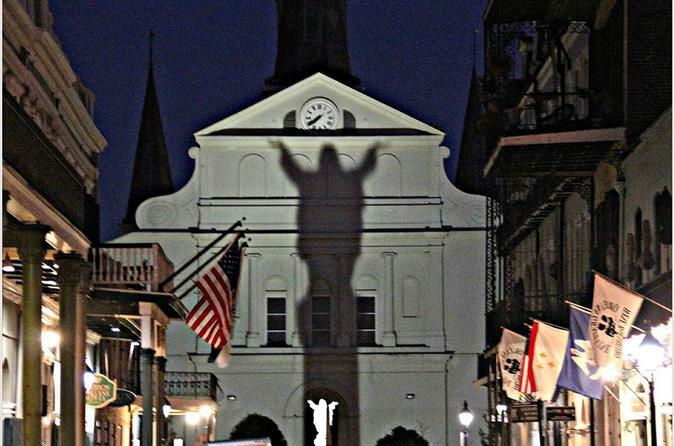 Take a spooky stroll through New Orleans on this guided, 2-hour ghost walking tour of the famed French Quarter. Experience the darker side of New Orleans, use real paranormal equipment, and hear tales of the city's haunted heritage as told by a professional storyteller — stories of ghosts, vampires, voodoo, and the unexplained mysteries of New Orleans. It’s a fascinating, spine-tingling adventure. Ghosts, vampires, witches, voodoo, and unexplained mysteries all together in one tour. Follow a licensed guide into the dark alleys for the thrill tour like no other. This chilling adventure covers not only ghosts and vampires, but also tales of voodoo, witches, and unsolved mysteries. Each of the stories that guests will hear on this tour have been derived from police archives, city records, and independent research. Hear the tales of unsolved murders and crimes of passion that left their ghostly imprints in this history. Follow in the footsteps of a mysterious serial killer many believe was something other than human. Use real paranormal equipment and find out why things just aren’t always what they appear to be in the hidden corners of the French Quarter. A real emf ghost detector will be used during this tour.